Thanks to everyone who donated to my IndieGoGo Campaign for the Chef Deck playing cards. I have shipped out perks to everyone who donated. If you are one of them, you should have them soon. Running a crowd funding campaign was an interesting experience, and the main thing I learned was that it is a lot of work! I’m glad I did it and was able to get my playing cards professionally printed and get them to the people who wanted them. Thank you again for being part of that experience. In case you were wondering, I ordered extras, so if you missed out and would like to get some playing cards you can order them on my website through Paypal. They are also available in my Etsy Store along with recipe cards and art prints. These are super limited, so act fast. If you want them in time for Christmas, please order by December 11th. Thanks again for the support. I look forward to creating more fun stuff to share. The playing cards are here. I had to chase down the mailman to get them, but here they are! The Chef Deck playing cards are professionally printed on luxurious linen cardstock and have their own box. 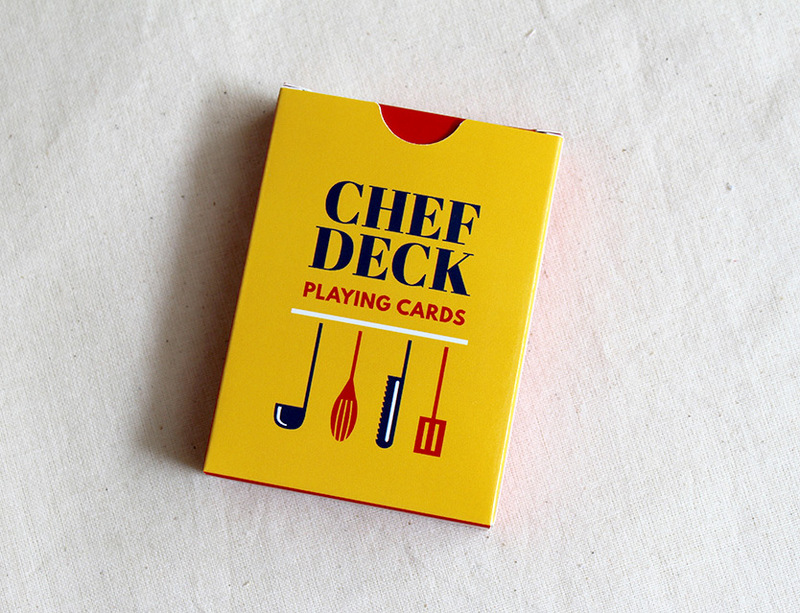 The Chef Deck is a cooking-themed deck of 54 cards. The standard suits are replaced with kitchen tools and foods that relate to a four course meal. The face cards feature different female chefs of various ranks illustrated in a minimal style that embraces geometric design. This was a really fun project and it is so cool to see the finished product. Who’s up for a card game? From the start I knew that I wanted the face cards to be fun illustrations and I knew all the chefs would be women. The hardest part of designing them was figuring out their style. I wanted them to have a whimsical quality, but not be overly cute or childish. The more research I did lead me to be inspired by minimal illustrations from the 1950s and 1960s which are composed of geometric shapes and forms. Next was figuring out the faces. The simple sketches I did were giving them a child-like quality which I didn’t want. I continued to simplify the facial features until I decided to eliminate them completely and use white space to determine their form. The hair and hat helps to anchor the head even though they float in space. Ultimately it matches the minimal style of the cards with the use of white space, limited color palette and simple illustrations. The cards have been submitted to the printer and I should have them in a few weeks! Shortly after posting photos of my playing cards project, I really got the bug to make them a reality. It was a project I did in my last year of school and was one of my favorites. The project was to design the foundation for a deck of cards, 16 in all. Now that I’m done with school and a good span of time has passed between first designing these, I am ready and motivated to finish the deck. I’m currently working on them and plan to get them sent to the printer by the end of June. Let’s pause a second. I heard a great bit of advice from writer Neil Gaiman a few years that has really stuck with me. He was on the Nerdist podcast and talked about the questions and advice his fans seek out about writing. The most obvious answer to most of these questions is to JUST WRITE. (Which I think we all know to be true, but want a different, magic answer.) Another solid piece of advice is to FINISH THINGS. That second one has really stuck with me since then. It doesn’t apply solely to writing, but to all creative endeavors. Even if it isn’t that great, or you don’t feel the best about it, finishing something gives you several important benefits. Firstly, the freedom to move forward with the experience of that project and secondly, the feeling of completion. It takes a lot of focus and work to finish a project. When you scatter yourself too thin it becomes very difficult to continue and easy to get discouraged, but can also help you discover what you really want. Not every project is going to be amazing, but the experience of doing it and completing it improves your skill set and makes your future projects better. It also reminds me a lot of this Ira Glass clip. OK, now back to the cards. I’m in. I’ve been working A LOT on these cards over the last week. I’ve finished up the number cards and am now completing the face cards. I’m going to post some of the process including ideation and sketches. I’ve done the research and picked a place to get them printed. My goal is to get them complete and sent to the printer by the end of June. Afterwards, if there is any interest, I may offer a few decks for sale. We’ll see. Let’s get these printed first.